An all-out war of words broke out between the Congress and the BJP over the issue of poverty reduction today with top ministers challenging Gujarat Chief Minister Narendra Modi to a public debate on the development model in the state. The BJP today demanded a white paper on the status of Indian economy. The party said the Planning Commission’s latest figures showing a fall in the number of people living below poverty line were intended to help the government manipulate the number of beneficiaries because it did not have the wherewithal to fund the ambitious National Food Security Ordinance. Welcoming the court verdict convicting IM operative Shahzad Ahmad in the 2008 Batla House shootout, the BJP today asked senior Congress leader Digvijay Singh to apologise for “misleading the people, demoralising security forces and raising doubts on the martyrdom of MC Sharma”. The Congress core group meeting here tomorrow under the leadership of party president Sonia Gandhi is expected to deliberate on the tricky issue of whether a separate state of Telangana should be carved out of Andhra Pradesh in line with the announcement which the Centre had made in December 2009. Bangladesh Foreign Minister Dipu Moni today expressed confidence that the Indian Parliament would ratify the land boundary agreement (LBA) during the upcoming monsoon session. One person was killed and over 20 injured during the fifth and final phase of the panchayat elections on Thursday. The total number of deaths during the five-phase poll stood at 64 while the last phase recorded a turnout of 75%. Close on the heels of over a dozen incursions since the face off in Ladakh in April from across the Line of Actual Control (LAC), Chinese troops made a fresh attempt to violate the International Border at Chumar area in north-east of Leh on July 20 but were forced back by Indian troops. Defence Minister of France Jean-Yves Le Drian will be arriving in India for talks with the Indian side, which are scheduled tomorrow. The Indian side will be led by Defence Minister AK Antony. A Delhi Juvenile Justice Board (JJB) today adjourned its judgment on the juvenile accused in the December 16 gangrape and murder case and his sentencing in a robbery case until August 5. Arun Nehru, former Union minister and a powerful figure during the Prime Ministership of Rajiv Gandhi, passed away tonight after prolonged illness. With the Punjab Government announcing setting up of New Chandigarh — a new concrete reality dangerously close to the original city — questions are being raised about the cost involved both in terms of the impending loss to the eco-fragile Shivaliks as well as the burden that the new township will put on the City Beautiful. In an attempt to rein in popular protest, the Akhilesh Yadav government today recommended CBI probes into three recent high-profile murders. The duty of school teachers and principals is to teach students and not to supervise cooking of meals, the Allahabad High Court has observed, close on the heels of Bihar mid-day meal tragedy. The Central Bureau of Investigation probing the Ishrat Jahan fake encounter case has announced a reward of Rs 5 lakh for any additional information on Zeeshan Johar and Amjad Ali Rana, who too were killed with Ishrat and Pranesh Pillai alias Javed Sheikh on the outskirts of Ahmedabad on the morning of June 15, 2004. Two rhino poachers were killed in an encounter with forest personnel in the rhino abode of the Kaziranga National Park (KNP) in Assam today. Slamming the BJP on twin counts of questioning, the poverty data released by the Planning Commission and asking Nobel Laureate Amartya Sen to return the Bharat Ratna for criticising Modi, Information and Broadcasting Minister Manish Tewari called Modi for a debate on the Gujarat Governance model at any place, time and platform of his choice. Terming as unfortunate the BJP demand for return of Sen's Bharat Ratna, Tewari said the Opposition party was fascist as had been "proven time and again". "They practice the policy of - if you are not with us you are against us and so you must return the Bharat Ratna and even the Nobel Prize." Tewari was responding to BJP's tirade against Amartya Sen who recently said he did not want Modi to be India's PM considering the anti- Muslim Gujarat riot in 2002. As the two parties fought over poverty reduction statistic released by the Planning Commission, the Congress said it was strange and sad that any party should "squabble over poverty reduction data". Responding to the ongoing controversy on a US visa to Modi, Joshi said it was the prerogative of a country to decide on granting a visa to any individual. "Besides, Modi has not even applied for a US visa," he asserted. The US on Thursday said if the Gujarat CM applied for a visa, his application would be considered in accordance with its immigration law and policy. Senior BJP leader Mulri Manohar Joshi asked Prime Minister Manmohan Singh and Finance Minister P Chidambaram to explain to Parliament with the help of a proper schedule how they intended to stop the downslide of the rupee, create jobs, reduce inflation and non-performing assets of the banks. He also mocked at the Congress leaders who claimed they could buy a meals for Rs 12 and Rs 5. “Maybe you can buy e-food for Rs 5,” Joshi said. While actor-turned-politician Raj Babbar had claimed that it was possible to buy a complete meal for Rs 12 in Mumbai, going a step further, his Congress colleague Rasheed Masood said one could get a meal for Rs 5 in Delhi. “I don’t know about Mumbai. You can get a meal for Rs 5 near Jama Masjid,” he said. According to Joshi, the latest exercise by the Planning Commission on the number of people living below poverty line was aimed at reducing the Centre’s liability for UPA chairperson Sonia Gandhi’s ambitious “food for vote” programme and dump a substantial part of it on states. The shootout had sparked a controversy with Digvijay claiming that it was fake. “Digvijay Singh should admit that he made a wrong statement,” senior BJP leader Murli Manohar Joshi said. Party spokesman Prakash Javadekar tweeted: “The Congress must apologise for politicising Batla encounter case as Digvijay does not speak “off the cuff”. He speaks for Sonia & Rahul Gandhi”. “We welcome court’s verdict in Batla House encounter case. Now, Digvijay must apologise because he cast aspersions on MC Sharma’s martyrdom,” Javadekar said. “By his actions and words, he has supported terror suspects and demoralised security forces,” he added. The family of Delhi Police Inspector Mohan Chand Sharma, who was killed in the Batla House shootout, on Thursday expressed satisfaction over the verdict, and said the family now awaits the final judgment. Sharma's octogenarian father, Naurottam Sharma, said: "I am satisfied with the court's decision, but await the final judgment. I am worried that the accused can move the higher court." Chief Minister of Andhra Pradesh Kiran Kumar Reddy will be in New Delhi tomorrow while his Deputy Damodar Rajanarsimhan and state Congress Chief Botsa Satyanarayan have already arrived today after the Congress leadership asked them to be present in town tomorrow. There is a likelihood of Congress Vice President Rahul Gandhi holding a meeting with the Andhra leaders separately in a bid to take the process of consensus building forward. Home Minister Sushil Kumar Shinde is also expected to meet the Andhra brigade. The Andhra leadership, meanwhile, has been asked to submit their respective roadmaps on the issue of division. This task had been assigned to them when the core group last summoned them to discuss the Telangana matter separately. In that meeting, it was decided that more meetings would be held before the matter is taken to the Congress Working Committee (CWC) for a final decision. The CWC is the highest decision making body in the party and had in 2001 recommended to the NDA government that the Telangana issue be referred to a Second State Reorganisation Commission. While a decision on the issue is inevitable with Congress general secretary in charge of the state Digvijay Singh saying this in so many words, the Congress is said to be awaiting the results of local body elections in Andhra to sense which way the public support is swaying. The Telangana region has 17 Lok Sabha seats out of 42 in Andhra. 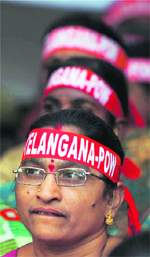 The Congress would want to weigh its poll prospects before it makes a move on Telangana. A decision on the issue is not expected before the end of ongoing local body elections in Andhra by the month-end. Hyderabad: Amid indications that the UPA leadership was inching towards a decision to carve out a separate Telangana state, a political showdown has begun in Andhra Pradesh today with the resignation of 12 legislators opposed to the bifurcation of the state. Precipitating the bitter regional divide over the Telangana issue, 12 MLAs from Rayalaseema and coastal Andhra regions sent their resignation letters to the Assembly Speaker N Manohar to protest against the possible bifurcation of the state. They included a senior Congress MLA G Veerasiva Reddy and 11 from the YSR Congress Party headed by the jailed MP YS Jagan Mohan Reddy. “I am very hopeful that things that are in the works will come to fruition. Both sides have worked very hard on the agreement. Regardless of their party affiliations, I think they (Indian lawmakers) would be able to see the larger picture in India-Bangladesh ties and act accordingly... it will happen,” she said during a question-answer session after delivering the fourth RK Mishra Memorial Lecture, organised by the Observer Research Foundation (ORF). She indicated that she would also be meeting Leader of the Opposition in the Rajya Sabha Arun Jaitley during her stay in New Delhi to seek the BJP’s support for the LBA, which was signed between the two countries during Prime Minister Manmohan Singh’s visit to Dhaka in September 2011. Moni was confident that the prospects of the ruling Awami League in Bangladesh would not be affected even if the Indian Parliament failed to ratify the LBA by the time her country goes to the polls early next year. The ‘assertive posturing’ by the Chinese troops, who had climbed a small mountain where they faced Indian troops, has been flashed to all units along the Sino-India border in the area to keep a strict vigil on their movement, official sources said today. Chinese troops claimed it was their territory and they were headed towards to Tible area, 5 km deep into the Indian territory. Chumar, which is located 300 km from Leh, is the last town after which Himachal Pradesh starts. This area also has the distinction of having a defined International Border with China. Chinese troops, who were confronted almost bang on the border by alert Army and ITBP troops, said they needed to follow the orders of PLA headquarters and conduct some photography in Tible area. According to a senior official, no contract will be signed during the visit even as discussions will revolve around equipment that India is buying from French defence manufacturers. “No big contract is to be signed,” a senior French official said today. On July 11, the JJB had passed a judgment on the accused juvenile in the case of a robbery. The JJB had held him guilty in the case and was to sentence him today. The board had to pass the verdict on the juvenile in the case of the brutal gangrape of a girl in Delhi on the night of December 16. The murder charges were added in the case after the girl died in a Singapore hospital on December 29. Principal Magistrate Geetanjali Goel, who is presiding over the JJB, however, adjourned the sentencing in the robbery case and the judgment in the gangrape and murder case for August 5. The matter was postponed following an affidavit filed by Janata Party president Subramanian Swamy at the JJB. On Tuesday, the SC had agreed to hear Swamy’s plea on July 31 on a fresh interpretation of the term “juvenile”, which he had raised in the wake of the December 16 gangrape and murder case. Nehru, 69, a cousin of Rajiv Gandhi and Minister for Internal Security in his government, died in a hospital in Gurgaon, according to family sources. The funeral will take place at the Lodhi crematorium here on Friday. Nehru had been admitted to a hospital in Gurgaon 18 days ago and passed away at 10.47 pm tonight. He is survived by his wife Subhadra and two daughters. Lucknow-born Arun Nehru was a three-time Lok Sabha member. Nehru had a successful career in the corporate world before joining politics in the early 1980s. When Rajiv Gandhi became the Prime Minister in 1984, he was his close adviser and Minister of State for Internal Security. However, he fell out with Rajiv later. Nehru was accused by the CBI of causing a loss to the exchequer in a pistol deal with Czechoslovakia in 1988 during his tenure as Minister of State. The Supreme Court had recently stayed the proceedings in the case. But the Punjab Government is pressing ahead. The government says the new township will boast of world-class facilities such as a state-of-the-art medi-city, spa village, edu-city, golf course and other recreational facilities. Punjab’s controversial project has become a talking point among the general public, town planners and architects after The Tribune ran a debate on various aspects of the issue and how it posed a danger to Chandigarh’s already strained infrastructure. In this, the last of the series, The Tribune presents arguments and concerns of prominent personalities of the region. T he concept of ‘New Chandigarh’ is akin to an ambitious bird strutting in borrowed feathers. If the township was fundamentally sound and innovative in its vision, mission and design, it would not need the prop of brand name Chandigarh. Worse, the design of the new township, as gathered from media reports, departs considerably from the rigorous discipline enjoined for the capital complex, not least in respect of authorised high-rise buildings. Thus the bird, even as it plagiarises the big name, might fly unfettered by strict controls applicable to City Beautiful. 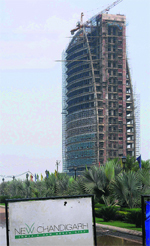 This might well spoil the skyline for even the citizens of the ‘old’ city. According to Corbusier’s grand design, which had legal authority, no urban construction was to be allowed within 16 km of the outer boundary of what is now the Union Territory of Chandigarh. Even while Mohali, Panchkula and Chandimandir are infringements of the original master plan, these three settlements bear their own names. They do not discolour the borrowed feathers as the township with the evocative name is likely to. By naming Mullanpur as New Chandigarh, the state will be making money but it has to be seen whether the people would get basic amenities like water and electricity properly. Already, there is shortage of water and electricity. The idea behind planning of Chandigarh will be totally lost. The ecology of the area is a matter of concern and account of all the concerns has to be taken. The Punjab Government’s move to create New Chandigarh will damage Chandigarh’s legacy and the unique status it enjoys. Why associate a new township with Chandigarh’s name in the first place? New Chandigarh also envisions a totally different architecture with high-rises that would ruin Chandigarh’s skyline. Then, there also is a political and bureaucratic angle to the whole thing with deep vested interests involved in acquiring land and subsequent real-estate development. Further down the road, there are a host of socio-economic and infrastructural issues like road links, civic amenities and availability of jobs as well as environmental concerns. One will also have to look if suitable educational institutes and employment opportunities will be available there or whether people will have to commute long distances. The new township is coming up in an ecologically fragile area in the foothills of the Shivaliks. It will further degrade the green cover. New Chandigarh would border the existing city of Chandigarh to its north and south, resulting in an enlargement of the urban sprawl. This is bound to have a serious impact on the overall administration of Chandigarh. Water, electricity and road connectivity are issues of prime concern. The new township will add to the population which has to be looked after and its social and economic needs have to be addressed. This is an issue of prime concern. If there is no industry, people there will be dependent on Chandigarh for jobs. This will create additional burden on the already inadequate road infrastructure, causing heavy traffic snarls and consuming time and fuel. New Chandigarh will definitely affect the existing city of Chandigarh and add to its administrative complexities without giving anything in return. Both Punjab and Chandigarh need to sit together and jointly work out the future modalities pertaining to provision of civic amenities, communication and industry so that the infrastructure and socio-economic structure of the urban complexes does not fall prey to adhocism and unplanned development. The naming of Mullanpur as New Chandigarh is a move to cheat people. Already, Mohali and Panchkula have come up in violation of the New Capital Periphery Control Act. But by naming a place or extending a settlement does not make the difference. Compared to Mohali, the planning of Panchkula is much better. Naming another city after Chandigarh is not a healthy sign when another government does it. Chandigarh Administration officials may consider taking up the matter with the Punjab Government. The city’s master plan must take account of what is happening in the periphery. This is not a coordinated development of the city under the regional master plan. It will put burden on the city. Ultimately, the city is going to bring more people to Chandigarh by way of public transport like metro. The government should appoint an independent team of architects to study the entire issue. In my opinion, a city so close to Chandigarh should not come up. City Beautiful has the credit of being the only planned city in the country. Bringing the new city close to Chandigarh will certainly put pressure on Chandigarh. The haphazard growth of Zirakpur is a classic example of planning going haywire. The new city should be planned 40 km away from already urbanised centres and they should act as counter-magnet centres that attract people away from Chandigarh. The transportation network between such cities should be enough to handle passenger load. Instead of Mullanpur, Punjab should have planned the new city at Anandpur Sahib, Morinda or at a distance from big towns in the state. The area where the city has been announced is an eco-sensitive zone. The step to rename Mullanpur as New Chandigarh is certainly a step to give impetus to realtors and builders. As a result, buying a house in and around Chandigarh has gone out of reach of the middle class. Only building cities away from already urbanised areas will keep prices in check. Chandigarh has to be saved at any cost. The move to name the new city New Chandigarh is ill-conceived. It is land mafia at work. The architects who tow the line of the land mafia become rich and others are left out of the race. We should learn from the disaster in Uttarakhand as lack of planning can lead to tragedies. Chandigarh’s master plan is complete as it has taken into account the issue of comprehensive development at the micro and macro level. We should make every effort to save Chandigarh at the national and international level. Cities cannot be static. These have to grow. In case of Chandigarh, it is just an area of 114 sq km and there is no scope for expansion. As a result, the adjoining states are exploiting the situation. Even the Central Government exploited the situation by setting up Chandimandir Western Command. In a situation when land is limited, it makes sense to go vertical provided the government ensures regulated development. It is a normal phenomenon for developmental growth to slowly move out of the old or established cities...it is inevitable. As Chandigarh is developing into a metropolis, peripheral areas are prone to growth. But people or private developers should not be allowed to undertake haphazard development as has happened in Ziarkpur...the government must intervene. Like Mohali, Mullanpur would be a polycentric growth centre. As New Chandigarh is contiguous with Chandigarh, it has all the inputs and ingredients for growth and infrastructure development. But again, the government has to regulate the growth and keep the eco-fragile characteristics of the area in mind. Adequate provision has to be made to ensure that the natural course of small and big seasonal rivulets in the area are maintained and adequate space along their banks be developed as green areas. Private builders should not be allowed to eat up such land. Naming Mullanpur as New Chandigarh is a political decision. Naming a city is very important as it builds its character. It is good approach to call it New Chandigarh as it will give the place a fine character and make it liveable. The example of naming Mohali as Ajitgarh or SAS Nagar has created confusion in mind of the public, especially outsiders. As the population pressure has increased manifold, the need for wide roads, more houses, more power and electricity, higher capacity sewage treatment plants is being felt. At the same time, the ecological balance has to be maintained. In such circumstances, there is no harm in coming up with new townships. But it must be ensured that the heritage importance of the city is not disturbed. In case of New Chandigarh, those moving to destinations like airport, railway station and the Inter-State Bus Terminus would use Madhya Marg and other roads, thus increasing the vehicular density on city’s roads. This will result in more traffic jams. The Punjab Government must ensure that it provides more accesses, especially alternative roads, to airport, bus stand and railway station so that Chandigarh roads do not get congested. Punjab must ensure that the normal life of city residents should not disturbed. The issue of increasing population density in the upcoming city will certainly have regional consequences. The Punjab Government’s decision to create a new township at Mullanpur and naming it New Chandigarh is wrong. Many politicians, bureaucrats and other bigwigs, by mutual connivance, have converted their rural land, bought earlier, into prime urban property whose value will get enhanced hundreds of times. Naming it New Chandigarh amounts to intellectual dishonesty as it seems to be designed to lure more people into buying these properties. The burden of the population of this new township will be borne by the infrastructure of Chandigarh, be it health, education, recreation and other facilities. The existing civic infrastructure of Chandigarh is already bursting at the seams as its population is many times more than what the city was planned for, not to mention vast slums created as ‘vote banks’ for vested interests. Rather than developing townships around Chandigarh, these should be evenly distributed in the entire state at places like Sunam, Mansa, Tarn Taran etc. New Chandigarh will not affect Chandigarh. Rather, it will be a better township as population pressure cannot stop the march of urbanisation. It will not put pressure of water and electricity on Chandigarh. On the pattern of Punjab, Haryana is coming with townships in Panchkula extension and Pinjore. Himachal Pradesh has developed a town at Baddi. The new city will complement Chandigarh and the services will not be affected. Mass transportation systems like metrorail will boost the economy. If Punjab moves its offices out of Chandigarh, there will be vacuum in the city. The city just has 144 sq km area whereas Punjab has a large area. On the pattern of National Capital Region, Chandigarh region is developing into a state capital region. The planning and infrastructure of Chandigarh has inspired each one of us since the time of its inception. However, as land becomes scarce and the desire to own a home in the vicinity increases more than ever, there is an inspiration to take the legacy forward by creating its satellite town with similar infrastructure and a new vision. Just bordering Chandigarh is this new vision called ‘New Chandigarh’. Satellite towns are a natural progression in any big city’s lifecycle. Gurgaon and Noida to Delhi, Navi Mumbai to Mumbai, Sikandarabad to Hyderabad are examples of how cities have expanded. Each of these satellite towns has an independent infrastructure. New Chandigarh is being designed with a futuristic town-planning approach. The vision to make it self-containing will make it progressive and non-dependent on any other city. In fact, in the long run, it is poised to be one of the major contributors to the region’s economy. Hyde Park Estate, the DLF township, is designed keeping in mind low population density norms. It has acres upon acres of open and green areas. It is an environmentally conscious township with provision for rainwater harvesting, solar panels for street lighting and use of recycled water for irrigation purposes. The central investigating agency will now probe the murder of former Azamgarh MLA Sarvesh Singh ‘Seepu’ on July 19 along with his private security guard. The murder took place virtually a stone’s throw from the Jiyanpur police station. The next day, Jiyanpur police station SHO Vijay Singh was arrested for the murders. The state government also ordered a CBI probe into the mysterious death of 20-year-old medical student Neeraj Bhadana on July 10. A native of Faridabad, she was a first-year student of MBBS at the Teerthanker Mahaveer University in Moradabad. On July 6, she was reportedly murdered and her body thrown from the fifth floor of the girls’ hostel to pass it off as a case of suicide. Later, a post-mortem report stated that the death occurred due to strangulation. The police has not ruled out sexual assault before the murder. Similarly, a CBI probe has also been ordered into the murder of Agra's Dayal Bagh Educational Institute PhD scholar Neha Sharma who was found murdered in the institute's laboratory on March 15. The Agra police has arrested the institute's laboratory technician Yashveer Singh Sandhu and Dayalbagh Education Institute president Prem Kumar’s son Uday Swaroop for the murder. Swaroop is a final year BSc student at the same institute. The observation by the court in Uttar Pradesh came even as three lakh primary school teachers across Bihar boycotted mid-day meal duties today on the grounds they interfered with teaching work. The court was hearing a PIL filed by Meerut-based UP Pradhanacharya Parishad. Though the CBI has already established the killing to be a fake encounter, it believed that more information on the two alleged operatives of the Pakistan-based Lashkar-e-Toiba could help it to progress in the investigation on the fake encounter. The information available so far on Zeeshan Johar and Rana was sketchy and not much was known about their antecedents. While Rana is said to have belonged to the Kashmir region and had migrated to Pakistan at an early age for training in terrorism, Zeeshan hailed from PoK. Both were believed to be on a “mission” when they were caught in Gujarat by the crime branch. Neither their families could be traced nor were there any claimant for their bodies after the fake encounter though the state police waited several days before burying them in Ahmedabad. The CBI chargesheet says both were kept in separately confined till the morning of June 15 when they were brought to the encounter site and killed with Ishrat and Javed to “establish” the claim that the four were traveling together in the car “driven” by Javed and were on a “mission” to kill chief minister Narendra Modi and other Hindu leaders. KNP director NK Vasu informed that a group of poachers were challenged by the forest personnel near the Maloni Forest camp in the Bagori Range of the park and in the ensuing encounter between the two parties, two poachers were killed while at least three others managed to flee. The identity of the slain poachers was yet to be ascertained. Forest personnel recovered one .303-rifle from the possession of the slain poachers. Two rhinos were killed by the poachers in the same area recently. The encounter site is not far from the National Highway-175 that forms the southern boundary of the national park. The director informed that 16 rhinos were killed by poachers within the boundary of the Kaziranga National Park so far this year, while 40 rhinos have died natural deaths during the same period. As per the rhino census carried out in March this year in the Kaziranga National Park, it was found that the number of one-horned rhinos in the park increased to 2,329 compared to the figure of 2,290 as per the last year’s census.